A new study based on data available with World Bank, UNICEF, and the US Agency for International Development has found that women still carry majority of the burden of fetching water for the household. At least 14 million women and three million children (mostly girls) in 24 sub-Saharan African countries travel long distances to collect water and spend more than 30 minutes per trip, found a study published in the journal PLOSOne. The study is one of the first to quantify the numbers of women and children fetching water from long distances, in Africa. It builds on a previous study on access to potable water and provides insight by looking at the absolute number of people affected and the differences between urban and rural regions. Water collection labour can negatively affect human health. It also places high demands on the metabolism, and results in pressure on the skeletal system leading to early arthritis, says the study. The study also focused on gender differences among children and their burden of work in fetching water. 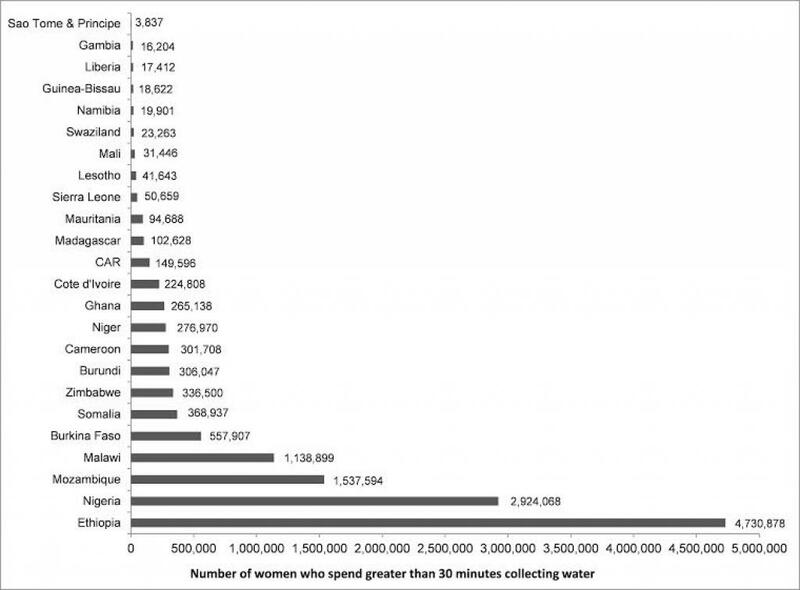 While water collection practices vary across countries, the study finds that female adults and female children consistently carry the greatest responsibility for water collection, for both collection times less and greater than 30 minutes. Adult women were the primary collectors of water across all the 24 counties included in the study. In 10 of these, adult women were reported to be the primary collector of water in more than three-quarters of households. Liberia was the only country where less than half the water collection (greater than 30 minutes) was done by adult females (46 per cent) while Cote d'Ivoire was found to be the worst with 90 per cent of the adult females responsible for the task. There were four countries where more than one million households reported an adult female as the primary water collector when collection time was above 30 minutes: Nigeria (2.9 million), Ethiopia (4.7 million), Malawi (1.1), and Mozambique (1.5 million). Only 10 of the 24 countries had less than 100,000 households with an adult female as the primary water collector when water collection time was above 30 minutes. The burden of water collection also trickles down to girl children, who were found to shoulder the responsibility 62 per cent of the times, as opposed to 38 per cent of times for male children. Six of the 24 countries had more than 100,000 households where children were reported to be primarily responsible for water collection trips that took more than 30 minutes a day. In Nigeria and Ethiopia more than one million households had assigned the water labour to children. This has found to affect their health and the children also lost the time that would be spent in the school, says the study. "The journey to collect water every day harms health, uses up limited human energy and takes time away from other opportunities," said Jay Graham, assistant professor of Environmental and Occupational Health at Milken Institute School of Public Health at the George Washington University. The daily practice causes musculoskeletal damage, soft tissue damage and can lead to early arthritis, Graham said in a statement to Thomson Reuters foundation. "By reducing the distance to water—preferably by having water piped to each household—many women and girls would be freed up for work, school or other activities," he added. 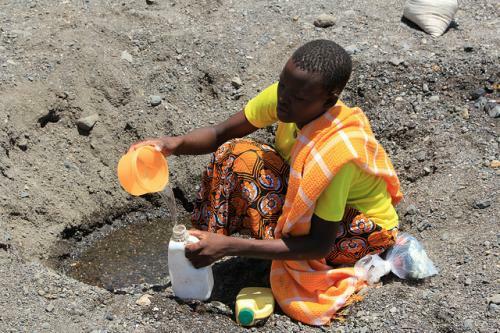 The report also studied the gender ratio of adults engaged in collecting water for household chores. It found that all countries had gender ratios above one, indicating that adult women, more than men, shouldered the responsibility for water collection. While 17 of the 24 had gender ratios below 10, seven countries had gender ratios over 10—Burkina Faso (15.1), Cote d’Ivoire (26.2), Gambia (18.6), Guinea (53.9), Malawi (18.1), Mali (19.9) and Mozambique (15.9). In urban areas, adult gender ratios were typically lower than in rural areas. Projections show that climate change will increase the water-stress in African nations. The United Nations Environment Programme has warned that by 2050 around 350-600 million will be exposed to increased water stress due to climate change. Climate change and variability are likely to impose additional pressures on water availability, water accessibility and water demand in Africa. As climate change advances, drought is becoming more frequent and severe in southern Africa. This, combined with this year's El Nino phenomenon, it has taken a heavy toll on rural lives and economies. "With climate change, it's going to be more of an uphill battle," said Graham. "If there's focused attention on it and resources, we can improve upon the situation but I do think it's going to become more difficult," he added. There is an urgent need to advance women’s participation in decision-making and to better understand the social dimensions which affect the water collection practices in African countries. The effort taken to fetch water by women and the extreme gender imbalance for water collection should be considered as key indicators for measuring progress in the water, sanitation, and hygiene sector, the study recommended. It added that investments to monitor and address water collection labour are needed in the region. The study advocated for gender-sensitive monitoring of the progress on access to water and sanitation. Is Urbanisation the best way to preserve the African environment?